Remember how I told you that One2One Network is spoiling me, sharing all of this wonderful, new music with me? Well, this review is a little overdue, but no less of an impact than any of my recent reviews. Okay, I'm lying. A little. Aren't you?! 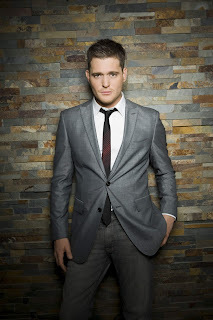 Michael Bublé is freaking HAWT! 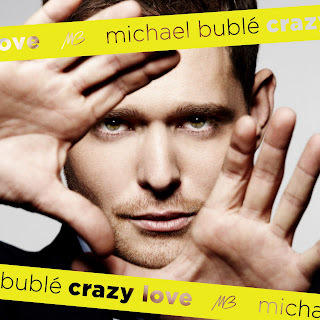 Just as his looks tickle my fancy, so does his newest CD - Crazy Love. With tracks like "Cry Me a River", "Georgia On My Mind", and "Haven't Met You Yet", you'll fall Crazy IN Love! Singer and songwriter Michael Bublé has sold over 22 million albums worldwide. His previous album, 2007’s Grammy winning "Call Me Irresponsible" was a #1 album in over 15 countries. His 2005 CD "It's Time" holds the record as the longest running title to remain on the Billboard Traditional Jazz charts – a full two years. It sat in the Number One position for over 80 weeks! He has had two #1 singles, "Everything" and "Home" which was also a #1 hit for Blake Shelton on the Country charts. The title song is a cover of the Van Morrison gem “Crazy Love” The CD closes out with a haunting version of "Stardust" which is performed with the acapella group Naturally 7. The album was produced by David Foster, Bob Rock and Humberto Gatica. You can check Michael out at his Facebook Fan Page, his website, and you can buy Crazy Love at Amazon.com. I've told you before how I love Hip Hop, R&B, pop, even some good old rock-n-roll... I have heard Michael's name before but I had never voluntarily listened to him. In fact, I couldn't name anything he sang. Now I can. I loved this CD and I'm sure I'll enjoy it for quite a few more years. Maybe until the kids are gone, so they can stop complaining about me listening to it so much. I leave you with this: Go watch the "Haven't Met You Yet" video, in case you need to be convinced some more. Thanks to One2One Network for providing me with this CD to review! Disclaimer: I was sent this CD to review. Receiving a product will NEVER influence the review I write here. My opinions are my own and yours may vary.